The Office of External and Governmental Affairs supports the DMU campus and greater community with our vision to be a policy consultant and catalyst in healthy community discussions and transformations. As an institution, we are committed to providing community service with approved time out of the office that encourages our employees and students to support community partners. Every day, we make a difference helping those organizations in alignment with DMU’s mission and vision. As a major provider of graduates in the health care professions, it is a priority for us at Des Moines University to take a leadership role at the state and federal levels on issues important to our institution and graduates. 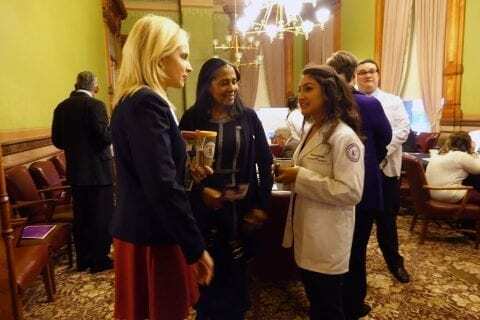 We work to coordinate opportunities for our students to meet and work with members of the Iowa Legislature. Each year, students tell us how important they consider their early experience in the legislative advocacy process. They learn first-hand the value of being involved in policy discussions for their professions and the proper procedures for engaging with elected officials. For more information on how to become involved in government and community relations efforts, please contact Sue Huppert. To support the professional organizations and the issues important to the fields of Podiatric Medicine and Surgery through IPMS, Osteopathic Medicine through Iowa Medical Society, Public Health, through the Iowa Public Health Association, Physician Assistants through the Iowa Physician Assistant Society, Physical Therapy through the Iowa Physical Therapy Association, Health Care Administration priorities and support those legislative issues of importance to the professional organizations of our graduates in Iowa. Understand, clarify, educate, and monitor issues important to students and our graduates of our colleges and programs. A request of $250,000 in the 2019/2020 fiscal year and each year to follow, to support enhanced psychiatric education and learning opportunities for our students in a clinical setting with an objective to better prepare the family medicine providers and others as they enter the health care workforce. Support the Greater Des Moines Partnership State of Iowa Legislative agenda item of a fund for a public private partnership to support the recommendations and work of the Children’s System State Board. Continue to support the renewal of the Health Care Recruitment dollars currently being administered by the Iowa College Aid Commission. Request funding from the State of Iowa for the Forgivable Loan Program passed in the 2012 session and partially funded since this time. Work to increase this to the 4 million dollars originally proposed to support funding at the level of 10 DMU students annually (and 10 from the University of Iowa). 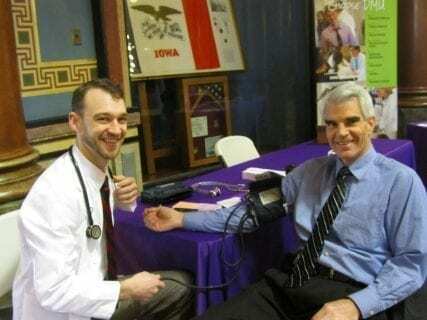 Des Moines University continues to be involved in the Community Health Needs Assessment (CHNA) and will work to support resources needed in our community as identified in this report. The CHNA workgroups include mental health, workforce, access, physical environment and youth. 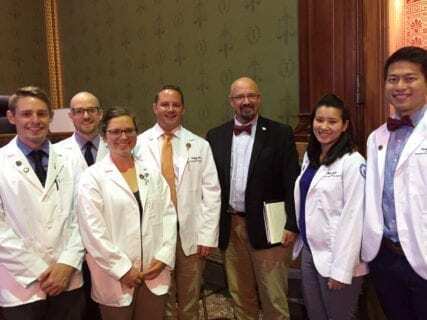 Continued dollars for new Graduate Medical Education Dollars in the 2019 fiscal year with the increase as first identified of 4 million dollars to ensure a pipeline of health care providers for the State of Iowa rural communities. To continue to strive to be the convener of legislative forums, healthy discussions, well-being and other health related messages and efforts to our community in support and our mission and vision. Limiting Grad Plus Loan borrowing levels for graduate and health professions students is being discussed at the federal level, with the potential impact to our students being a significant shortage in available financing for their education. We will work to educate and share the impact this federal action could have on DMU and its current and future students, and will strive to find a workable solution. Senate Bill 1871 VA Provider Equity Act to ensure the podiatry profession continues on its path to parity. Identify federal support for mental health priority for Des Moines University. Support grant requests and applications presented to the Federal Government and seek written support of the Iowa Congressional Delegation. Continue to educate and share the need for additional G.M. E. for our graduates in Iowa. Monitor Reauthorization of the Higher Education Act and respond to proposed language impacting DMU such as Grad PLUS Loans, state authorization and other possible proposals.